Madrid: Ediciones Cultura Hispanica, 1944. ( IN SPANISH - EN ESPAGNOL - EN ESPANOL ) 337 pp. ; Facsimil Edicion. Ejemplar Nº 1244 de 3000. 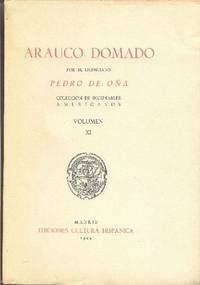 "Arauco Domado por el licenciado Pedro de Ona. de; Real Colegio Mayor de San Felipe y san Marcos. Obra impresa en Lima, por Antonio Ricardo de Turin en 1596, y ahora editada en facsimil. ; Paperback. Light wear on covers and spine. Dustjacket is slightly yellowed and has curled edges but no rips or tears. Book is clean inside and solid. Good condition.. Paperback. Good. 8vo. 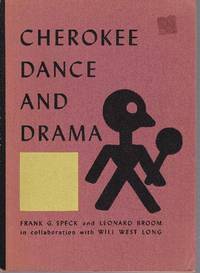 Berkeley and Los Angeles: University of California Press, 1951. 106 pages and illus. with 22 plates (8 with bright yellow backgrounds) & 12 text figures; Written in collaboration with Will West Long. ; Paperback with slightly rubbed and discoloured cover. Small corner of back cover missing, Book is otherwise clean and solid. Good condittion.. Paperback. Good/No Jacket. 8vo. Chapel Hill : The University of North Carolina Press, 1957. 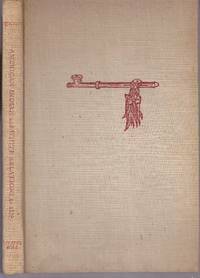 138 pages; Original hardcover cloth. Slight yellowing of the boards around the edges. Name and address of previous owner on first page, Ink annotations on pages 11, 107, 108, 109 and back page. Book is otherwise clean and solid. Good condition.. Hard Cover. Good/No Jacket. 8vo.